How are you? Hoje, no podcast, eu falo sobre mais uma expressão super comum do inglês, além de um produto usado para limpar o box (de vidro) do chuveiro… Não perca! So let’s get right into today’s expression, or idiom: imagine you’ve been consuming a certain product for years. Same brand, same product for, say… a couple of years. Not just you, by the way. Let’s say you and your friend Jenny buy the same product. 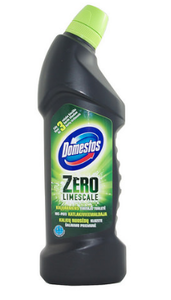 And, let’s say we’re talking about a… limescale remover. Yeah, I’ll take the opportunity here to talk a little bit about what a limescale remover is, ’cause… I don’t think you’re going to learn this at your English course. First of all: limescale is that sort of white deposit that builds up over time especially on shower doors that are… made of glass. The last place I lived in Brazil had a glass door near the shower – so if you have the same I’m sure you know what I’m talking about. If you don’t, trust me – limescale is one less problem for you to deal with. So in case you can’t find limescale removers in your local supermarket, I’ll just go ahead and share with you some useful information that I found… Lemon juice and vinegar will apparently do the trick if you’d like to remove limescale from the glass doors. Now, here where I live I can find a couple of different brands of limescale removers in the cleaning products section of my local supermarkets. So let’s go back to my little story from the beginning of the episode, where you and your friend Jenny have been using the same limescale remover for a couple of years. Jenny recommended this product to you two years ago, and you started using it. And then, what happened yesterday was that you bumped into Jenny when you were both at the bank – she had just paid some bills, while you were just about to go in and get some cash. And.. somehow, you guys got to talking about house-cleaning and limescale just came up. Jenny said the following to you: “My friend, I would like to ask you to forget all about limescale remover ABC, which we have been using for a while, and give limescale remover XYZ a try. I found out about XYZ a couple of weeks ago… My glass door in the bathroom needed a good scrub so I thought, why not? Let me try XYZ out – it IS a little bit more expensive, but you will see it is worth every extra penny! Limescale remover ABC pales in comparison to XYZ. It just pales in comparison! Many times when people watch a movie, and then the sequel, they think the sequel pales in comparison to the first movie. Or when you read a book and then watch the movie adaptation, you think the movie pales in comparison to the book. Here’s a dictionary definition: to pale in comparison is to be or seem less important, impressive, or otherwise deficient when compared to someone or something else. You know, it’s like limescale remover ABC and limescale remover XYZ: ABC pales in comparison to XYZ. So, what is it that you used to do or consume that pales in comparison to the thing you do or consume now? In other words… it’s like you had an upgrade. You used to do something or go somewhere and now you’re doing something else or going to a different place. And the previous thing pales in comparison. Let me know in the comments and talk to you next time! Muito obrigada por me contar que o site ajuda :-) Fico suuuper feliz em saber!! Thanks for recommending Inglês Online! The service from taxi in my city pales in comparison to uber. Now i just get uber. Wow, interesting. What’s your favourite thing about Uber? i think is that you don’t have to have cash to get a ride. i don’t have cash money on me ever. hahah . That is the best part about Uber, as well as the app which is very easy to use. Acompanho seu trabalho desde 2010, Ana. Desde então dei uma sumida e mas voltei… E como era de se esperar, sempre conteúdo bom e prático. Como tenho aprendido com você. Muito feliz em saber que tem sido útil!! Como eu nunca soube do seu podcast antes? Deus salve o iTunes! De agora em diante estarei acompanhando, muito obrigado pelas dias! Além de ouvir o podcast você recomendo alguma outra coisa para reforçar o estudo? Encontre outros podcasts que vc gosta e compreende, e manda ver. Sempre acompanho seus áudios e dicas. Parabéns pois tenho aprendido bastante! Uma dúvida…você teria alguma aula ou programa para quem está mais avançado? entre o avançado e fluente? No momento, não. Está nos planos. Continue aproveitando os pods, e quando tiver você vai ficar sabendo. Previous Post Podcast: Idioms com scratch Next Post Podcast: That was just bizarre!